Landlife is a registered environment charity and founder of the National Wildflower Centre (NWC) as a millennium project in 1999. The Landlife Group includes the NWC visitor centre, a Merseyside-based community programme and our regional and national work of creative conservation. We are working mainly in urban and urban fringe areas to make better places for wildlife and people and to bring us closer together. By using simple wildflower mixes, based on common core species, we aim to create wildlife areas which have sustainable links to their communities. Landlife has a trading enterprise Landlife Wildflowers and works as a wildflower farmer to grow and supply native seeds. All profits from sales are covenanted to support Landlife charity. We also provide support and consultancy services for local authorities, community groups, landscapers and gardeners. You can buy seeds and helpful publications from our online Wildflower Shop. 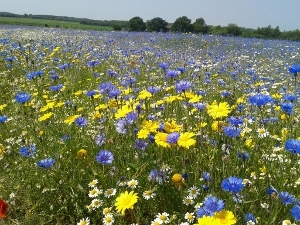 Our National Wildflower Farm is in St Helens on Merseyside and our seed is of local provenance and complies with national standards for native wildflower seed.Visit our Wildflower Shop to learn more about which wildflowers to put where, supporting bees and pollinators, find plants by colour and height – or choose an eco gift and celebration ideas!